I think that, when you’re running for Mayor of a city that’s having a hard time retaining talent like good webdevs etc, that it’s pretty tone deaf to pass them all over and outsource your campaign site to a firm in NYC. Back in 2008 Kelly Flood used local talent for her (excellent) campaign site, why couldn’t Gray? It’s also a bit disingenous to compare services like web dev to consumer products like an iPhone or a laptop. Rob, The graphic that you show basically says it all, and the key word is right there. 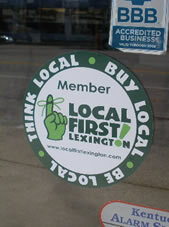 Local FIRST– think local, be local. Allison’s comment to me was suggesting that there will be a locally produced web site on the way. Candidate Gray did not bring in a local company first, he went toward a national firm initially. I am about buying local as much as the you and some others, but if it cannot be found locally made then I will move on to a regional brand, then national. I don’t think that everything has to be made in Lexington but lets try to keep it in the state. Be Ky Proud….. Be Damn Ky Proud. This is like comparing apple to oranges. Comparing Walmart to using a D.C. web dev co.? At least Walmart provides local jobs, pays taxes here, etc. How is it not practical to use a local web designer in any way? Even if the site is temporary (which the site didn’t indicate), I know local web designers that could have got that site done in less than 3 hrs. It would have been better (and possibly cheaper) to just buy a web template and have someone on his campaign do it. It’s more about the hypocritical nature of it all. LFUCG outsourced their own site, a $24,000 template to an out of state co., the CVB outsourced its “brand” to an out of town company for “a lot” of money, the WEG site was outsourced and now this. What’s even more odd about it? A tremendously talented Lexington web design firm that designed Gray Constructions website shut its doors at the end of Feb. Maybe having VM Gray’s site wouldn’t have helped them, but maybe it would have. Do we we expect VM Gray to wear a handmade suit from Fayette County? No. But when it comes to using SERVICES that are available here and of equal quality/value, then YES. Especially when you advocate the creative class and young people all of the time. Reducio ad absurdum is a rather lame argument, to say the least. It’s not “local only,” it’s “local first.” Aside from the fact that you are factually incorrect in implying that Coke has no employees here in Fayette County (they have a rather large distribution center off Leestown Road), it is a bit of a stretch to say that the Bluegrass area doesn’t have ANY high quality, award winning, or innovative web designers – because we do. So what is Jim Gray’s motive for using a WASHINGTON firm? When anyone says “Washington,” are they thinking local? No, he’s thinking of a career in Washington at a later date, and is using this mayor race as a springboard for that, obviously. That’s a straight-line projection, no absurdum required. Rob, are you suggesting that I’m shopping locally when I buy a Malaysian rubber bicycle tire from Scheller’s bike shop and not shopping local if I buy that same item from WalMart? Both companies pay taxes in Fayette County and employ Lexington’s citizens. If we were only discussing “local first” for products then only agricultural products would ever considered pure enough for local designation. The issue that the twitter discussion highlighted was that comparative local services were passed over for for the sake of convenience, and not for reasons of practicality as you have suggested. Your argument supposes that it’s excusable on the basis of practicallity to overlook our local businesses. Not only is this weak, but considering that the candidate in question has lamented that his own business was overlooked for local opportunities, seems inconsistent at least. I’m not goign to defend every specific site mentioned in the comments because I personally don’t know what each one’s rational was in chosing a firm that was not local but I do want to say that there are design/advertising/web firms that specialize in political campaigns or working with governments. Even if their design isn’t special or amazing, sometimes the process can be. I can’t speak for all designers but I know I’m not cut out to deal with layers of beauracracy even if I can and have designed smaller political websites. So do you pick someone because they’re close or because they actually fit the project and your goals? Possibly already even have experience in that specific field or work well with large infrastructures? Rob — thanks for a well reasoned essay. “Local First” is not a litmus test. It means what it says: explore and utilize local options first when it makes sense to do so. To the previous commenter who sees no difference in shopping at a local bike shop vs. Walmart, please think where the profits of those businesses go (clue: it’s either Lexington or Arkansas). If the bike shop needs someone to prepare their taxes or design their ads, it’ll most likely be someone in Lexington. If Wal-mart needs to do the same, it’ll be someone at the home office in Arkansas. That is the multiplier effect at work. Steve; apparently your litmus test is; where the profits go. I like this test for politicians too but profit is only a part of a commercial transaction, not the whole thing. Why does Local First have to be about where the profits go? I’ll pay a small premium to shop at a locally owned business but I’m not willing to pay a premium if I also have to travel further to that locally owned business. I’ll shop at the stores that employ my neighbors regardless of where I perceive the profits to be going. My whole point is that we do consider our neighbors in the Local First equation. Thanks to all for the vigorous discussion about the limits of buying local. As Steve and Hilary shared, while profits, employment, and local tax receipts are part of the equation, there are many additional considerations which come into play when making a complex decision on where to purchase. In this particular case, the considerations might have included whether the developer had the capability to comply with campaign finance regulations, for instance. Or the candidate may have wished to preserve confidentiality prior to a public announcement. Either of which might plausibly explain why the candidate chose a D.C. firm instead of local ones. Buying local shouldn’t be a litmus test. There are good reasons why someone might choose a non-local firm. Not all local goods and services are equivalent to what else is available. The choice to buy local isn’t always clear-cut. Ahavah, I never asserted that Coke doesn’t have local employees; Indeed, almost all of the businesses I listed do. Whatever the limits of Swiftian absurdity, it is more internally consistent than the “He’s using a Washington firm, so he must be planning a career there…” conceptual leap. There are plenty of other reasons to choose a D.C. firm to do campaign work.